By logging your bookings on the St. Kitts website, you will be eligible for client upgrades and other fabulous benefits. 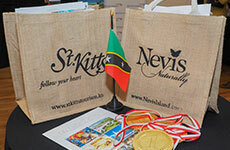 The St. Kitts Specialist Course comprises of 4 modules, with a review at the end of each one. You’ll touch on St. Kitts’ famous hospitality, its vast range of accommodations, adventure activities on both land and sea, an overview of our sister island, Nevis, and a review of our various value-add programs. Take the final exam and – voilà – you will have become a St. Kitts expert. Client hotel upgrades (depending on availability) plus a free gift.